Ten young Muslim writers won the Young Muslim Writers Awards 2017 on December 9 in central London. In addition, a Special Recognition Award was presented to a young boy for his bravery in saving lives and for championing the right to education. 350 people joined in the celebration of recognising young talents in the Muslim community at the fifth awards event, a project of the Muslim Hands organised in association with Yusuf Islam Foundation. 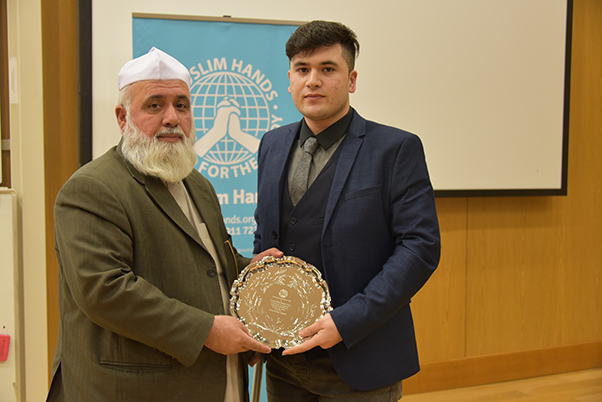 Muhammad Ibrahim Khan, 15, received the Muslim Hands Special Recognition Award for his bravery in saving lives and for championing the right to education. 144 people, mostly children, were shot dead when gunmen open fired at Peshawar’s Army Public School in December 2014. A student at the school, Khan, was shot four times after helping four children to safety and whilst trying to save a friend. Paralysed from the waist down, his family appealed for help on national TV, securing the support of many celebrities and property developer Malik Riaz Hussain. The family were able to raise funds for Khan’s treatment in London. Since his treatment, he is able to walk again and has settled in London where he has now started his GCSE’s. “Thank you to Muslim Hands for this award. We, the children, are the future. The future lies in our hands, but only through knowledge. Education is the only solution; education must come first,” Khan said. Umar Ibrahim, 6, won the Writer of the Year 2017 award as well as winning Key Stage 1 Short Story and Short Poetry. “I was shocked and exhilarated to win the Young Muslim writer’s Award. It was totally unexpected. I can’t wait to enter next year!,” Ibrahim told The Muslim News. “After camping out in the Sahara desert I wrote about sleeping under the stars by a crackling fire and witnessing shooting stars and the Milky Way stretching across the heavens. The best way to write and create good descriptions is by experiencing it first,” he added. For him, the most enjoyable way to share his stories is with his family “There is nothing more exciting than lighting your own fire and sitting around with your family sharing stories under a blanket,” he said.